A return visit by Amey and their road/rail machine visited two bridges DJW4 and DJW6 ably hosted by Tom Tait and it is apparent that these inspections are most thorough that will mean the results will be interesting or quite frightening. Amongst the bridge exams the PWT conducted a full line track patrol including, this time, Ravenstor and the truncated Gorsey Bank line. No horrors were reported but steady routine maintenance to occupy the team for evermore. The Buffet Car had more Fing Umber Orient gloss applied to the west side and there may be a further illustration of this tomorrow. The S&T van received a cleansing and reorganisation of its interior and the new Idridgehay raised platform area was drawn to a conclusion. The other half of the permanent way team turned their attentions to despiking baseplates recovered from the former Gorsey Bank line and, after conclusion of the bridge examination work, were able to take the Works Train down the line to recover some 100 base plates and 24 reusable sleepers. The lone Carriage Cleaner with an younger assistant was intent in making up for the hours lost last week through illness, an example to us all, and continued to achieve a makeover of the Mess Hall. Some of this activity transferred to several coats including mine! The Carriage Cleaner also managed to cleanse the Training Room and declare her willingness to assist with costume design and manufacture for the Santa season. Leigh has published an expansion of the Santa programme following the acceptance of the key player jetting in on his most busy day of the year. I attach a photo of the headboard that will grace his trains splendidly constructed by Alan Taylor who has provided a wide variety of headboards to support our various activities. 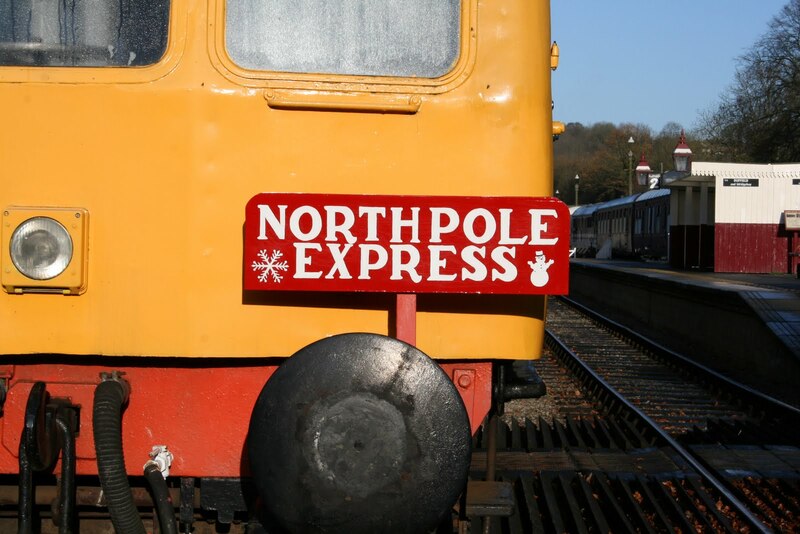 By popular demand, we are pleased to announce that an extra Santa Special train will run between Wirksworth and the "North Pole" on Christmas Eve 24th December 2011 at 11:15. This can be booked online, alongside all of the other Santa Specials at http://www.e-v-r.com/santa . Having pressed the send button I realised a grave omission! The PWT were in action recovering materials from the former Gorsey Bank line, again in the most miserable of weather, and loaded some 123 reusable sleepers and 250 base plates and chairs. Quite an achievement resulting in great dampness and well earned baths and tinctures tonight. Another day of excitement and a legion of activities. In the south Scott Wilson had been charged with inspecting the A6 bridge at Duffield (DJW1A) and were ably assisted by Chris and John who ensured the scaffolding was transferred to site from Chapel Lane, due protection put in place and the event derigged at the end of the day. Unusually this is the only bridge on the line owned by the Highways Agency happily releasing us from the responsibility for its maintenance. In the north Amey had been charged by Network Rail to commence a detailed inspection of all our other overbridges and two were dealt with today with the help of Tom Tait who looked after their every need. Today's photo is provided by Tom showing the road/rail machine and the Amey team clearing some ivy off the Wash Green bridge at Wirksworth. In amongst all this vital work the VCT were able to head for the "racing straight" reporting the task of dealing with our neighbours activities nearing completion with one large fire to burn the brash. Mike the Flail concentrated his attentions to the area around Derby Road 3, or Old Lane bridge, until a burst hose brought events to a stand. The machine was returned to Hazelwood and the offending pipe repaired with not too much loss of hydraulic fluid. The DST piped up the lubricator on Henry Ellison, removed the cladding from No3's boiler and loosened bolts on Kathryn declaring themselves content with the day's work.The S&T van entered its final phase and hopefully the paint will harden off before it is released into the wide world again. A new hand wash was fitted to the staff toilet after the previous one developed terminal leaks and the Booking Hall brought its accounts up to date, continued planning for 2012 and developed another attractive ticket in response to encouraging on line sales of day rovers. All this was done against of background of atrocious weather and it is a credit to everyone involved that they didn't just pack up and go home! A slight note of joy is that I have now had confirmation form the Department for Transport that we can use the brand name "Pullman". carefully compared side by side. can now be smelt throughout the site. This report should have come to you last night but I fell asleep in front of my laptop! Arriving at Wirksworth Station at 06:30 to collect precisely 37 breakfast bags (not 36, not 38), courtesy of Leigh and Anton, I was gratified to see our two-car DMU waiting just to the north of the yard trap points. The train had been prepared by Mike Evans (04:00 start from Ashby-de-la-Zouch) and Tom Tait (another silly start from Alfreton) and as it rolled into Platform 2, it was well-lit, warm and inviting. While I loaded the breakfast bags, John Evans was busying himself with ensuring the windows were clear of condensation so our passengers could see out. Departing precisely at 07:15 after I had checked my passenger lists (thanks again to Leigh), Richard Buckby acted as Third Man to open and close the crossing gates as we headed towards Idridgehay where our final three passengers boarded. Arriving at Duffield was an extremely pleasant experience. The first thing we all saw were three magnificent Midland Railway station lamps illuminating our platform. Saved from the scrap man by Laurence Knighton and kindly donated to us earlier this year, the lamps were illuminated by David Newby had worked to a very tight timescale to install their heads with them being switched-on just the afternoon before! Rodney Thorne had opened-up the station in preparation for our early arrival and Eric Boultbee was present on the platform to meet our transferring passengers. Thanks to an on-time arrival, our passengers were able to savour the warmth of our train for around ten minutes before walking over to the main line. On the bridge at Duffield, Michael Webb from East Midlands Trains greeted passengers and handed-out EMT ‘goodies’ to us all. This was a very nice touch and it was also good to have some assistance with boarding on the presently shortened platform on the main line. The London train arrived promptly at 08:07 and it’s worth remembering that EMT started this train at Chesterfield rather than Derby just for us. Back at St. Pancras, EMT’s front-of-house team allowed us to board the 18:25 before the madding crowd, thus ensuring that we all managed to find comfortable seats. The journey was delightfully uneventful and an on-time arrival was achieved at Duffield where our return train was waiting on platform 3. Greeting us were Rodney Thorne with torch to help passengers down the old Down Slow platform, Pat Lidgett (Driver), Chris Beale (Guard), the full-of-stamina John Evans and two new faces, Peter Chambers as trainee Third Man and Ben Hendley acting as ‘Trolly Dolly’ serving extremely welcome teas and coffees for the returning travellers. Arriving at Wirksworth, the passengers dispersed merrily into the night, full of praise for the joint organisation of the EVR and EMT and after your correspondent returned home, more time was spent putting the train to bed and closing-up the station. This was an extremely significant event for our railway. Ten years ago, I recall the excruciating embarrassment of our then tiny team of volunteers being caught-out by the visit of a brass band to Wirksworth Station as part of the town’s Christmas celebrations. A decade on, I have mentioned fifteen names in this email and I know that there are at least half a dozen more in the background, not to mention three or four people at East Midlands Trains who arranged special stops and even, as mentioned above, the early start of one of their London expresses from Chesterfield. Importantly, the passenger complement was a mixture of our own people supporting the service and “civilians” who have no real interest in railway restoration but wanted to use our service for a day out in the capital without having to drive to Derby and find a parking space. let’s hope there will be many more. All in all, a great day and one acting as a pretty important indicator as to how our railway can grow in the future. I have uploaded some images of the day here: http://photobucket.com/thames-ecclesbourne2011. History was made today! We ran our first ever cross-platform excursion in conjunction with East Midlands Trains, taking an excited band of passengers from Wirksworth to Duffield where they changed for a specially stopped East Midlands Trains express service bound for London St. Pancras International. The Thames-Ecclesbourne Express departed Wirksworth in the twilight drizzle at 07:15 and rolled into London St. Pancras International bang on time at 10:07. Hopefully everybody had a great day out, even though, as I write, we are still awaiting their return trip to arrive from London. The second crew of the day are, right at this very moment, preparing to return to Duffield to collect them (after a large indulgence of home cooked food at the Red Lion up the road of course). Fingers-crossed that there will be many more of these in the future! On top of this, our regular winter timetable ran with reasonable numbers and there was a very satisfied Day with a Driver guest. The on train trolley steward sold a few drinks and things, even if his products weren't quite as exciting as the breakfast bags prepared for the London passengers. Down the yard, the LMSCA continued working on their various assortment of vehicles and the 8F group continued to tube the boiler of Henry Ellison. The DMU team continued the refurbishment of 51505, cleaning and returning the luggage racks to the walls and putting up the light shades in the First Class area. The Class 20 Association were in attendance working on D8001. At one point, a paint brush was spotted! Back at Wirksworth Station, the passenger department began the daunting task of erecting this year's Christmas decorations. This is a thankless task which has grown considerably since last year with 3 stations and the Santa train to decorate this time. At Duffield, work continued on the repaint of the staff mess room to make it more presentable. Quite a busy day actually, specially for November! The Class 20 Association had a maintenance and training day for their own members and a refresher for our drivers. Opportunity was taken during the day to load the components for the new raised section for Idridgehay platform and deliver to site. A permanent way trolley required for a bridge inspection next week was delivered to Duffield making productive use of this exercise. The lamp head project at Duffield moved forward leaving a little fine tuning outstanding for electrical connections. 51505 received much attention during the day and the Booking Hall prepared breakfast packs and information sheets for tomorrow's Thames-Ecclesbourne Express. I would like to record my gratitude to the trains crews that will work most unsocial hours at the beginning and end of the day to ensure this exercise is delivered with our customary efficiency. 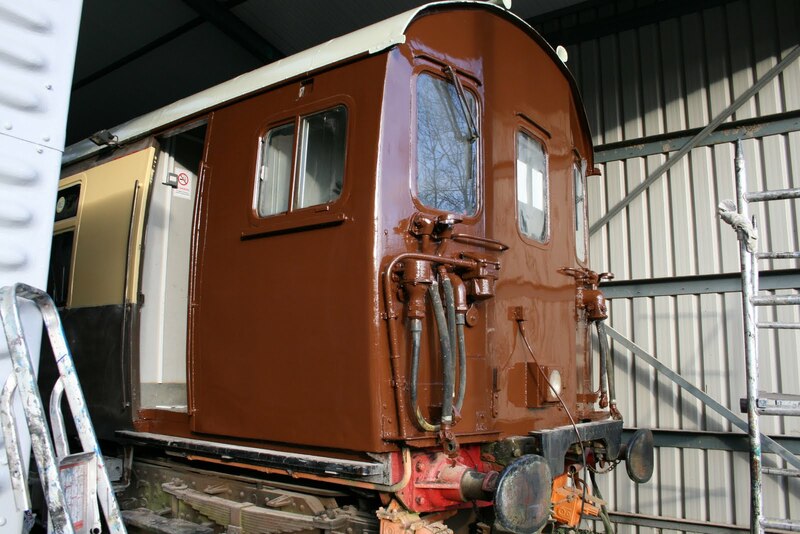 The refurbishment of the Buffet Car moved forward again with a second coat of Lancastrian Cream applied to the west side and the first example of the gloss Fing Umber Orient being applied. A further taste of this vehicle is attached together with a sample of the delightful lamp tops at Duffield. 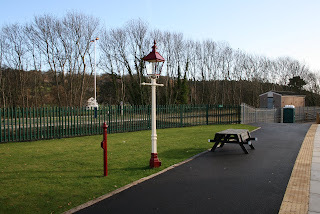 Our thanks go out to Lawrence Kinighton who initially saved the lamp posts many, many years ago and very kindly donated them for use at Duffield. Another most satisfactory day of endeavour with the VCT setting off first for a most productive day on the "racing straight" as they continue to cleanse the products of our neighbours tree felling activities. On the return back to Wirksworth they dealt with previous tree felling at 49 steps and declared themselves content with the day's activities which included the customary large fire. The dmu team had a rewarding day as they serviced and fuelled all machines in service over the remaining parts of the year. They also washed the down "west" side of the three car unit and it now sparkles, together with applying antifreeze to the toilet in the centre car so that we can be sure it is usable over the Santa Train season. The PWT were somewhat hijacked into looking after potential customers this morning and achieving a great deal of shunting during the afternoon that included putting the remains of No3 back under cover and releasing D8001 for its working day tomorrow. The Duffield lamp heads that had been the subject of restoration work by David Newby were fitted and it is reported that they look splendid. Their first task will be to illuminate the progress of passengers this Saturday who will enjoy the Thames-Ecclesbourne Express. 33035 received further attention from the Pioneer Diesel team as they work towards restoring its ability to supply Electric Train Heating. The Buffet Car had its first coat of Lancastrian Cream and a taster of how it will look is attached. The Booking Hall continued to process Santa bookings and clocked up the first sale of the advance opportunity to buy a Day Rover ticket for 2012. I also received a welcome offer of help for the Santa Train programme. Quite a significant day as we just achieved the 40% mark on Santa sales and I was pleased to receive one volunteer as a result of my comments yesterday. Work continued on the new raised platform section for Idridgehay and Mike the Flail dealt with vegetation around the former erosion site and along the straight south of Hazelwood before a fluid leak brought matters to a halt. To be fair to our well used Komatsu this is the first failure for some time and fitters will attend tomorrow. The PWT worked to the Thomas instructions to achieve 6 sleepers changed of the 18 specified between Shottle and Duffield and the remaining 12 have been dug out for ease of completing this task whilst the sun beats down on Hawaii. It was good to see Mike Jacobs tending to 33035 and he reported that he had introduced "solvent into the generator". Not totally sure what this means but I will listen and learn when he returns on Friday. 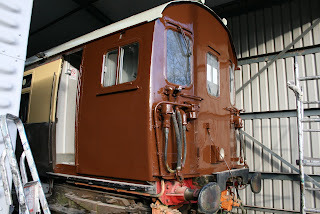 John Allsop rubbed down the filler previously applied to the Buffet Car but was defeated by the weather conditions in his objective of applying the first Lancastrian Cream Gloss. He will try again tomorrow. Our lone Carriage Cleaner reported in sick today and I am sure you will join me in wishing her a speedy recovery. After all she is the only person to accept this daunting challenge. Lots of people clustered around the S&T van which one suspects was a more preferable occupation than sleeper changing. Nonetheless both teams made progress as the van now gleams from the loving attention given to it and the reduced PWT changed six sleepers on the straight south of Gorsey Bank alongside Bournebrook Avenue. It is fair to say the PWT were significantly delayed shunting No3 to a place where the water tank could be lifted that, as ever, involved moving a host of other vehicles out of the way. The VCT returned to the "racing straight" to make further inroads to the tree felling from our neighbours activities reporting one very large fire to consume the products of their endeavours. The DST supervised the removal of No3's water tank and commencing servicing the various equipment on the locomotive as part of the annual maintenance programme. Henry Ellison enjoyed the manufacture of adaptors for the gauge glasses and completion of various pipe runs. Cathryn also benefited from further investigation into its condition including the loosening of the cylinder covers. The LMSCA sheeted the remains of the Third Open after another potential repairer had surveyed the restoration required. The Filing Fairy had another productive day and the Filing Fairy's assistant operated the track recording gadget between the Station and Gorsey Bank. We await the results with interest. The Booking Hall and Accounts Dept. were in full power as the cash from recent activities was dealt with and a new accounting system introduced for the current financial year. Yesterday saw the small, but perfectly formed, dmu team repairing the guards door on 51360 and the three car unit had its braking system checked. The Bubble Car, 55006, now has a cab heater offering yet more luxury to our driving team. The Santa season approaches and whilst this is a significant earner for most heritage railways we really have never achieved the volunteer support for our programme that gives certainty to market a season more aggressively. Bluebell's normal take from these activities is £200,000+ whereas we have barely topped £4000 in previous years. If there is anyone who reads this who would like to get involved please get in touch as what we offer will depend on who is prepared to participate. Please use the wirksworth_station@ wyvernrail.co.uk to indicate whether you wish to be involved as we can't continue to try without the will to make it work. The Thames-Ecclesbourne Express is nearly up on us! If you would like to be part of this special first excursion, the first of what we hope to be many, then please ensure that you have booked before lunch time on Thursday as this is the last opportunity for us to process your booking in time for Saturday morning. Bookings can be taken quickly and easily online (www.e-v-r.com/thames) and tickets will be made available for collection on the day as it is now too close to post reliably. all its many complete and amazing parts. able to complete their trimming, but now need a new chair. all the way to the LMSCA container. mostly gloss white, so making it easier to clean. A new version of the stock list is available for download from the "Enthusiasts" section of the website. Notable changes at the moment include the removal of a brake van and the Shark. After a chilly start it was a glorious day in Wasserville with many groups going about their business. The passenger service ran as per the winter timetable and some more Santa bookings were taken. This was in between fixing a leak in the roof of the Platform 2 waiting shelter and applying paint to various things at Duffield. Down towards the Engineerium, the LMSCA continued work to strip out the Third Open coach and the 8F group worked on tubing up the boiler for Henry Ellison. Work continued on the LMS Brake Van with parts of the roof sections receiving attention. The DMU team split in two with half finally completing work on the centre car's heaters so that the visitors are warm for Santa, whilst the other half managed a first gloss on the ceiling in 51505. Dmu maintenance featured with the Bubble Car being readied for tomorrow's services and the heaters were replaced in the centre car of Santa's train. Interior work continued on 51505. Two third of the Buffet Car roof has received its top coat and the Head of Gardening was in evidence in very fetching headwear. The Booking Hall also prepared for the weekend ahead and dealt with more Santa enquiries. I was pleased to receive the generous donation of a bottle of Chateau Chaumet Demi Sec in response to my appeal for something suitable to launch the restored S&T Van. "I name this van ??? and bless all who will toil in her"
We are pleased to announce that you can purchase advanced Day Rover tickets for the 2012 season from the Online Ticket Office (www.e-v-r.com/shop). If you are stuck for Christmas ideas, these make perfect gifts! Another most productive day where the VCT completed their fencing renewals at bridge DJW6 (Derby Road 4) and cleansed the area between Postern Lodge and Hazelwood of various rubbish and scrap. A three man team today as two members were at Broomfield College being introduced to the joys of chain saw operations. The PWT set off for Shottle where some 13 tonnes of scrap rail was despatched for eventual use in China or India and then tackled the unloading of the Sturgeon and its 20 rails from the former Gorsey Bank line. An Oaks Grampus was returned to Wirksworth to eventually receive a spare set of wheels for the 8F project that will be shipped to Shottle for long term storage. 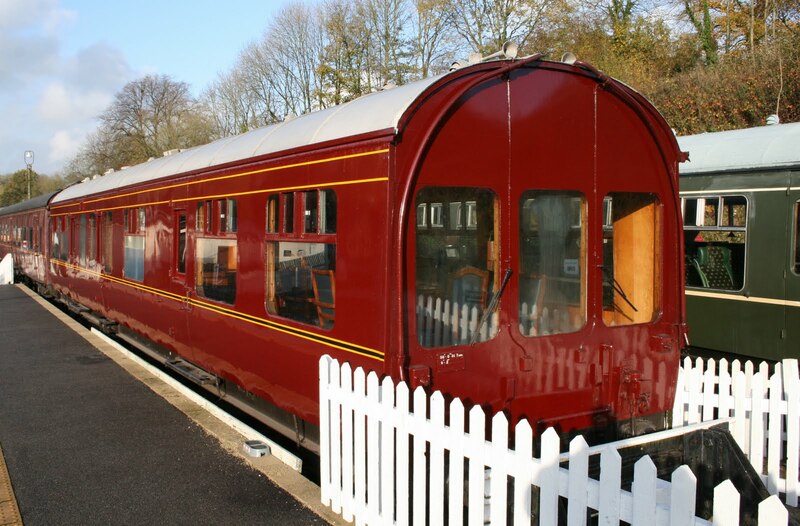 There was significant progress with the Buffet Car roof and application of a top coat, "Ash Grey", commenced to the S&T van which should be relaunched by a bottle of bubbly - we await your donation. After receiving all the necessary components a start was made on the new raised platform for Idridgehay. The Booking Hall continued to receive Santa bookings and it is quite interesting to note that there is a 50/50 split between postal and personal bookings against the online opportunity. This is the first year that online bookings have been possible and I thank Leigh and Robin for making this all happen. We are already discussing what other products may be made available through this medium. PS Dorothy has detected more knowledge concerning the whereabouts of Martin Bromley. He is temporarily residing in the Marlstones Day Centre, Aldgate Close, off Rock Street, Bulwell, Nottingham, NG6 8UQ. Tel: 0115 927 0629. Anyone who can visit would be welcome as Martin's family seem to live quite a long way away. Another day of great endeavour as the PWT divided into two parts the first of which dealt with the routine, but very necessary, track patrol coping with the whole line from Duffield to Wirksworth with the exception of the section from Callow Park to Wirksworth which will dealt with on another day. The other part of the team made a further five cuts in the formerly long welded section and fishplated them up. Good work from both teams that strides towards the obligations given to our Regulators. The lone carriage cleaner attacked the "Bubble Car", Training Room and my sub standard doorway with her customary attention to detail. It was good to see Jane Brownson who had produced and published a book on Duffield's pubs then and now. This is a pleasant and informative read with availability in the Booking Hall at £3.50. Mike the Flail concentrated on an area between Idridgehay Station and Old Lane bridge with the customary tidy end product and progress on the Buffet Car roof was most satisfactory. The S&T van has had a full undercoat applied and will be a great credit to the team involved when the gloss is applied. We had an afternoon Oaks who took delivery of more timber for his Brakevan restoration. The LMSCA continued with their BTO project and some progress was made with the steam engine shed extension. The Booking Hall caught up with the Santa and Thames-Ecclesbourne Express bookings and I am pleased to report that Santa has now passed 30% of the target revenue. After receiving 200 sleepers for the Wirksworth to Idridgehay section we need every penny we can generate. Another day with an amazing amount of activity at a time of year when normal folk are preparing for hibernation. The PWT collected 20 rails from the former Gorsey Bank line and restored the Hannages foot crossing to a single line. Numerous fittings were also recovered from unserviceable sleepers and brought back to base for safe keeping. The VCT finalised their clearance north of Postern Lodge and made a significant impact on the fencing near bridge DJW6. Three fires kept the team of five warm through the day. The DST worked on all three steam engines today with the tank on No3 being unbolted as it will have to be removed for winter boiler repairs. The mechanical lubricator on Henry Ellison together with its brake gear received attention as contractors dealt with the foundation ring. Kathryn also received attention as the smoke box was cleaned out after goodness knows how many years and research was done into how to access its mechanical stoking apparatus. We welcomed back the Filing Fairy after a couple of weeks illness and Fred & Iris gave the Mess Hall their traditional weekly cleansing. The LMSCA continued their efforts with the Brake Third Open and further strides were made with the Buffet Car. Anti corrosive treatment was applied to the centre line of the roof and the south end was sanded and filled. Three cheers to the EVRA contingent that fitted the new Car Park gate enhancing the security of the Wirksworth site. We welcomed the second visit of the Clay Mills Pumping Station team to whom we have donated the three capstans that lurk at the north end of the former Dust Dock. After much effort they have released two of the three. These artefacts could not be illustrated to our visitors and it seems appropriate they go to a good home where the principle can be shown off to visitors. The LMSCA have placed wood under the Mark 1 BSK to dry out that has originated from the fire damaged Third Open and this should not be construed as lighting up wood! In a tentative move I invited a farm steel erector to price up the costs associated with extending and widening the present Maintenance Facility together with the associated ground works and cladding. This will give us a guide price to create a large secure area on site. You may be assured that a begging letter will follow once these costs have crystallised! PS - Some of you will have seen the consequences of a runaway on the Pontypool & Blaenavon Railway. Not a pretty sight but a reminder that our whole Railway is on a gradient including the visually level Wirksworth Yard. It reminds you that care has to be taken in all areas of our activities and inattention to this can bite quite hard. We are kicking off 2012 with festive trains running on New Years Day. Passengers can enjoy a gentle excursion down the Ecclesbourne Valley with a service of Bucks Fizz and a mince pie. Children get orange juice and a mince pie instead. Tickets are priced at the usual fares (£10.00 adult, £9.00 concession, £5.00 child, £25.00 family) and are valid for one return journey of your choice. For the first time, we are pleased to announce that you can pre-book your tickets online by visiting our online ticket office (http://www.e-v-r.com/shop). Pre-booking can only be done online and not by post or telephone for this event but tickets are available on the day regardless. Online pre-booked tickets will not be posted, they will be available for collection on the day. So join us for a beautiful ride down the valley this New Year and start 2012 in style! A dank, grey day but there was a warm, Wirksworth welcome for our Group Drive a Diesel Day guests who were most ably hosted by Lewis and Richard. During the morning there was an opportunity to put LJB through its paces with some productive shunting. Additional the participants had the chance to drive LJB up and down the Incline. It is satisfying to report that the loco behaved faultlessly suggesting that the niggling intermittent fault has finally been cured. Angela provided the lunches and the team then joined the Bubble Car for the afternoon session. 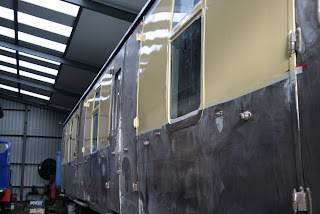 There was more good progress with the refurbishment of the Buffet Car with the front end being sanded down and more filler being applied to the doors that normally open as the entrance to the vehicle. A glimpse of the west side will give a clue to the eventual end product. The Tool Van has been resecured with an heavy duty lock and further modifications will be added next week to allow the vehicle to be safely stabled at Shottle when necessary. Steel plate was delivered for the new raised platform at Idridgehay. PS Some news has been received of the whereabouts of Martin Bromley who had disappeared off the radar. He has spend some time in hospital with an ulcerated leg and is now in a care home for a few weeks before returning home. Two friends are assisting with Martin's affairs as some renovation of his house is necessary. I have passed on our best wishes and anyone who wishes to enquire about Martin's progress can contact Gavin Lake on 07970 282 611 for an update. Another most productive day which started out damp and miserable and lost the damp through the day. 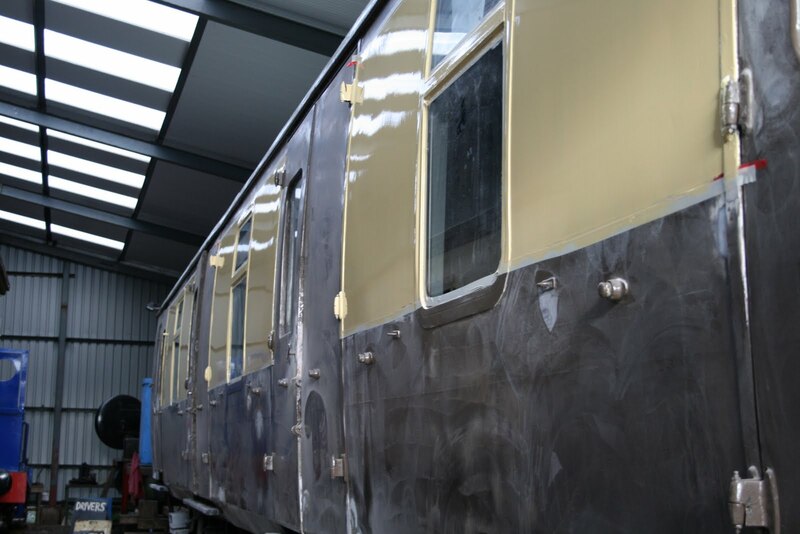 The Buffet Car exterior refurbishment is proceeding at lighting speed with undercoat being applied today that gives a clue to its eventual appearance. A four man VCT team achieved a number of significant jobs where they have closed off the cattle access at F4. These courageous beasts have travelled most of the south end of the line and, hopefully, we have eliminated their escape route. Some damage to the fence in the area of MP 134 has been patched and the sight lines at F7 improved. The fencing work at Travis Folly has been completed and one fire dealt with the resultant brash. This team continues to make a most valuable contribution to our enterprise. The PWT coped with the long journey to and from Shottle with our stalwart Faraday. The end result was some 12 tonnes of scrap rail is now ready for collection which will go some way to pay for the 200 sleepers ordered for the Wirksworth to Idridgehay section and are scheduled for delivery next week. The S&T van had paint applied but the anticipated grey paint delivery turned out to be blue. The LMSCA continued with their BTO project and our finest mechanical engineers believe they have bottomed the problems with LJB. We intend to use the loco intensively tomorrow to verify that the problem is finally resolved. The Booking Hall continued to service Santa bookings and we are gently approaching 30% of the target revenue. Another day of intense activity with spectacular progress being made on the exterior refurbishment of the Buffet Car. The S&T van also has moved significantly forward with yesterday and today preparing the vehicle for repainting so it will make a startling contribution to the presentation of the Works Train. Much action also with the Stanier BTO reflecting the determination of this team to overcome their previous setbacks. The PWT, with Faraday as motive power, set off for the lengthy journey to Shottle where more scrap rail was cut for disposal and a further three cuts made in the former long welded section as we work towards the first stage of cutting it into 240ft lengths. Mike the Flail set off for more vegetation control south of Shottle with another solid day of progress. The boiler of Henry Ellison had a riveting day with the foundation ring receiving the attentions of Israel Newton. The Booking Hall had quite a selection of Santa and Thames-Ecclesbourne Express bookings to process making the goals set for these two products gradually coming into focus. In the errors and omissions section I did forget to mention that Dorothy had a sense of occasion for our eleventh anniversary by providing cake for all active volunteers yesterday. A day where there were 50+ volunteers on our extended site which is not at all bad for a damp, miserable Tuesday in November. The VCT mustered some seven participants that tackled the fencing north of Postern Lodge on the Up (East) side between the crossing and the bridge over the brook. There is only 10 yards to go before this valuable work is completed and two large fires dealt with the resultant brash and redundant fence materials. The PWT pressed Faraday back into service to descend on Shottle to identify and cut scrap rail with further work to release important components from the life expired pointwork stored there. We hope that the financial result of this exercise will allow the purchase of more sleepers for the Wirksworth to Idridgehay section. Colonel Stephens would be proud! At Wirksworth the DST dismantled the ash pan and firebox stays of No3 as part of the winterising process. They most helpfully released Cathryn for movement to allow the Buffet Car to progress more comfortably into the Maintenance Facility where work has commenced on its exterior transformation. The LMSCA had their BTO (Brake Third Open) moved to the Weighbridge so that welding of vital parts can be accomplished. This quite involved shunt used LJB which had further repairs but expired at the end of the day causing much head scratching and a renewed attack on Thursday. The Car park gate was removed and collapsed during the process. We received it by accident from a renewal of the Hull - Doncaster line some years ago and had reached its terminal stage with us. A rather conventional farm gate will be put in its place. The Thames - Ecclesbourne Express received further two enthusiastic customers awaiting the Ecclesbourne-Seine Express which is promised for 2012 with, perhaps, the Ecclesboune-Rhine Express in 2013? of which are even now in my drawers. naturally there are colour and other issues). refreshments, hopefully without the squelching. First day of our reduced winter timetable which is operating throughout November and we had very pleasing passenger numbers indeed, with our bubble car running the services, it was quite full at times. Anton came in and opened our cosy staff training room as a public buffet which seemed to be quite popular too. Two Day with a Driver guests were hosted for lunch in there also. The 8F group were in attendance with much banging and grinding on the boiler of Henry Ellison and some work was done on the re panelling of the LMS Brake Van. The LMSCA were in attendance continuing with their unfortunate quest to recover usable components from the Third Open. The DMU team continued working on the refurbishment of 51505, trimming out areas of ceiling and testing the on board toilet facilities to discover any leaks. A tidying up sort of day with further shunting to both prove LJB's repairs and further tidy up the Yard. The water tanks were filled ready for No3's boiler washout and the Bubble Car fuelled and positioned for tomorrow's services. The Booking Hall had the joy of the annual stocktake following the end of our financial year. There are a few jobs I omitted from yesterday's report being otherwise engaged with the GCR team. The VCT completed the fixing of further palisade fencing at Gorsey Bank to secure the line from intrusions as a result of the development of the adjacent recreation area. The team then went on to the unending task of cutting and burning. On the dmu front 51188 had its lighting repaired and 55006 had a new heater fitted and the desk lights repaired ready for the darkness it will encounter of the next few weeks. I attach a photo of the new view at Platform 2A while the Buffet Car is being renovated in the Maintenance Facility. The main task of the day was a major movement of stock to place the Buffet Car in the Maintenance Facility for a makeover this winter. The associated Gatwick Express vehicles were also moved to a place where they can more easily take their place in the Maintenance Facility once the Buffet Car has been completed. As you may imagine this involved the shunting of almost all of our rolling stock and took several hours. I am very grateful to all involved for the effort put into this vital exercise. Graham and his team were faced with an immobile LJB and after a great deal of work have once again resolved the problem. It remains to be seen whether the solution allows us a trouble free day next Tuesday. The restoration of Faraday has certainly proved worth while during these problems with LJB. It gave me great pleasure to welcome a team from the Great Central Railway, lead by Bill Ford, and be able to personally thank them for their tremendous assistance with the opening of the whole line to Duffield. Without their generous help we would have had no Royal Saloon or the splendid sight of 78019 running up and down the valley. I hope they went away fully aware of our sincere gratitude. The VCT continued their attack on the lineside vegetation and the Booking Hall maintained its vital income generation role. Another most productive day with a few minor irritations! The PWT undertook a whole line track patrol with the exception of the Incline which is now out of service for some months. During the patrol there were some contacts with a herd of cattle that seemed to be also taking a look at our track conditions, perhaps anticipating their inevitable demise. In the end the farmer and his missing beasts were reunited with many observations by the former about life in general and cattle in particular. The lone carriage cleaner denuded the Gatwick vehicles of any remaining debris before they are scattered tomorrow and the de luxe Landrover set off for a successful check and maintenance of our many ground frames. The S&T van roof project is drawing to a satisfactory conclusion which is likely to be completed tomorrow. I omitted to mention the successful completion of work to the toilet on the centre car of the dmu set that will be used for our Santa services. John Gratton worked his magic yesterday and, as everyone who has looked after small children knows, you must have toilets available at all time for the little people. The Passenger Department had a constructive meeting about 2012 and one participant is now the Town Crier for Borrowash & Ockbrook which is a most worthy appointment. I say this as one who spend his childhood in Station Road, Borrowash. The irritations were that both Faraday and LJB manage to fail with a simple task to recover "garden" quality sleepers from the former Gorsey Bank line. Rescue again was in the form of D8001 which was a bit of overkill. As a result new batteries were fitted to LJB and air pumped into Faraday at the end of a long day. Both locos were started and it is to be hoped we can complete tomorrow's major shunting exercise can be completed without further drama. The Booking Hall reports that Santa bookings have now reached 20% of the target income which is quite cheering. 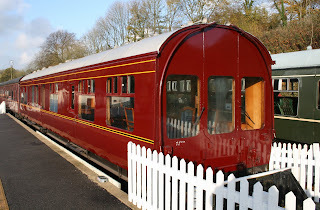 I am also pleased to report that BRB Residuary has granted permission, without charge, for the Railway to use the Pullman crest which I hope you will see in all its glory before the 2012 season starts - The Ecclesbourne Belle? no Sunday or weekday service. Room, which cannot be booked for meetings until further notice. As we enter the downhill run into winter, the day was unseasonably warm and sunny. Fred, Iris and Dorothy descended on the planters at Wirksworth issuing them with a splendid crop of winter pansies. Fred and Iris gave the Mess Hall their customary deep keep that does a little to encourage the idle to wash their own crockery. The VCT reported a three fire day as they worked north of Postern Lodge on the Up (east) side of the line accomplishing fence repairs as they progressed. They returned their Landrover to Wirksworth at the end of the day for servicing and antifreeze checkup. The DST met this morning in response to the Company's request that they consider how the infrastructure to support the operation of steam locomotives is developed for the future before embarking on the production of more active engines. The meeting was declared to be productive and we await an action plan. The LMSCA moved positively forward was steam pipe and floor modifications on the Brake Third Open (BTO) and had calculated that the vehicle will accommodate up to 42 people with a pleasant area for wheelchair bound passengers. The dreary job of stripping the Third Open also made significant progress. It is quite humbling to see true British spirit shining through. The PWT were frustrated again by LJB failing at the start of the day and resorted to Faraday that performed immaculately, if slowly, for the day allowing the transport of our Portaloos southwards with one deposited at Idridgehay and one at Duffield. In between these movements scrap rail was loaded to the Sturgeon. Fourteen rails to be disposed of were loaded and these are planned to be cut next week to be weighed in. Much progress was made with the S&T van reroofing project and, with the co-operation of Mike Evans, an extension of undercover time will allow for the repainting of the vehicle before being released into traffic again. The clearance of the Duffield office continued and a litter pick accomplished between the station and footpath F2 ( Holloway Road). The Buffet Car services were disconnected ready for its move into the Maintenance Facility on Thursday. The Booking Hall concluded accounting for last weekend and received another Santa booking.